Navoi city is located in the southwestern part of Uzbekistan, in the Zaravshan valley, in 360 km. southwest of Tashkent (400 km.). Navoi city is the center of Navoi region. The city was named in honor of the great Uzbek poet Alisher Navoi. In Uzbekistan Navoi is the youngest regional center. This modern industrial city has the convenient geographical location: 347 m. above sea level, on the left bank of the Zaravshan River. Among the steppes, along endless cotton fields, Navoi appears as an oasis, a mirage of oriental fairy tales - white-stone city with a significant architecture of residential and public buildings, the impressive silhouettes of large industrial facilities. This is a developing city, with great prospects and plans, with a huge potential. There are interesting buildings of present time in the city. Yujniy park (South park) is one of the favourite places among tourists and citizens. Stadium, swimming pool and cinemas are located in this area. The nature is wonderful. Besides, Severniy park (North park) was built. It is bigger than Yujniy park. 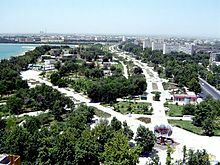 It was called Alisher Navoi Park. One of most important religious complexes in the Nurata city of Navoi region is Chashma complex. Kasim Sheikh mausoleum (X—XI centuries) and mysterious Sarmish gorge are located near the city. Numerous ancient rock paintings of people in strange clothes, some of which can be interpreted as images of "ancient astronauts", were found in the gorge. The gorge is recognized as the largest canyon rock art gallery in the world. 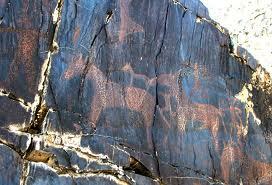 About four thousand of petroglyphs, which are engraved on the black shale are on the territory of two kilometers length.